I’m not sure if anyone else felt this way, but I was way more hurt after yesterday’s game than today’s. Yesterday I was pacing around like a crazy woman afterwards, and finally left the house not really knowing where I was going. (I ended up at the gym, of course). Today I was just sad. Things weren’t going our way, and the Silver Stars are a very good basketball team. They have some incredible defense, great ball movement and amazing shooting. It also didn’t help that the referees were horrendous again, and were letting Becky Hammon foul away freely. I was pretty OK when the game ended, but got a little sad about an hour and a half ago. I haven’t been this sorry to see a season end before. I don’t know if we could have handled it if we would have made it to the finals. There are still too many glaring holes in our game. One of the biggest for me all season long as been the lack of offense geared towards the posts. There is no high-low game, and that’s one thing I thought would be a staple for sure, given that we have the two best posts in the league. Secondly, why can’t we shoot the lights out from outside, like San Antonio? We should be able to do that. And why aren’t we experts at the free throw line? Finally, where’s our stifling defense? These questions will undoubtedly be answered over the off-season. In the meantime, I’m really concerned about our two rookies – both of whom have played non-stop for a year now. Candace Parker dislocated her shoulder six months ago, and has kept playing on it. She is about as mentally tough as they come, but I sense she’s not only physically but emotionally drained, because sometimes lately she’ll seem to zone out briefly during games. I’m a sensitive schmuck, and I pay attention. Unless I’m really exhausted, I notice just about everything, and saw a couple things our rookies did the last two games that gave us a brief glimpse into where their heads are at. She seemed to be completely torn up about it, which bothered me. Then there is Shannon Bobbitt. The girl is a real rookie, unlike her teammate, but she didn’t get much of a chance to be treated like one. She was thrust into the starting position when Temeka Johnson left the team to care for her dying grandmother, and the others weren’t performing as expected. Bobbitt shouldn’t have been put in the role, though, because she wasn’t ready. She should have been groomed for it, but she found herself in over her head. No doubt she was feeling pressure, and fans and journalists were relentless in criticizing the Spark guards all season, including today. Bobbitt landed on her stomach, and Hammon’s lower leg slightly brushed her head as she flew into the camera zone. 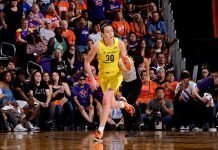 Bobbitt looked up at the ref who had whistled the ball dead, and then she put her head down on her hands and just laid on the floor, face down, for several seconds. Our poor girls. I am worried about them both, for different reasons. I wanted to open up the floor for discussion and observation. Was there anything anyone saw in either this game or the New York-Detroit games this weekend that provided insight into the state of mind of the player? Please share. Because I’ve always believed that it’s this kind of stuff that is the most important thing in life: figuring out the real stories behind the fronts. I have also tried to “read” our girls by the expressions I have come to know so well. This season during the LA games I have seen looks on all of their faces that I have never seen before. I have seen no joy. I have seen frustration, sadness, tiredness, and pain. As far as today’s game, well, to be honest, I sort of felt like yesterday was their best chance to win and when Sophia Young’s hail Mary shot went in I felt like the writing was on the wall. I felt like we were destined to lose today. Great skill isn’t enough in games. Often a lot of luck is involved and with the terrible refs in the league, well what can we do? I think Candace, Shannon, and Syd will be fine after a few weeks rest. I don’t know if Bobbitt ever got a gig overseas, but if she did she will be back on the hardcourt soon. Thank goodness Candace doesn’t have to go earn a living right away. She will now have time to actually look at her awards and reflect on an amazing two years. I don’t know if surgery is in her future, but I can’t imagine that she won’t need some type of surgery on that shoulder. I see her taking the next few months to breath and maybe do some commercials and magazine layouts. She will have fun! She will spend time with Sheldon and by next summer she will be ready to come back even better. She has had a terrible cold during this series against SASS and it showed in her emotions. I remember when Bucky scored the winning basket against LSU in the Semis… she was so emotional.. she grabbed Bobbitt of the floor and just held on for dear life. Yes, it’s over, but thankfully it is only over for this season. I don’t know what will happen with trades etc over the off season, we may never see the big UT 3 on the same court again. I hope we will but only time will tell. I know LA needs to play Spencer or trade her. I know we need a threat from the 3 pt line, and I know the LA Sparks had a great run. They only won 10 last year. I am proud of all of them. I love your post, ladyvols1. I feel like we’re both speaking the same language here. I’ve heard the destiny comment from a few people, and I don’t know. But I didn’t have a good feeling for Sunday when I went to bed Saturday……maybe there’s something to that destiny theory. But it’s really sad and I still don’t understand how a team that had so much fun off the court looked so miserable on the court so often. At first I was opposed to Candace playing overseas, but now I have a feeling she’ll get bored by December and miss the game too much. If she has to go, I hope it’s only from January on, because the girl really really needs the rest. Bobbitt was talking to her agent about playing overseas, and I hope she does. I hope Sid goes too, because I think the confidence of both is in the crapper right now. I’m proud of each and every one of them too. It’s been a long, long four and a half months since that bright shining day on May 17 when Candace shattered the rookie record. I hope our Vols will be OK soon. But wait, there’s (always) more…….